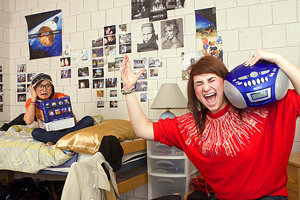 IC roommates ham it up for "Fuse" photographers Jeff Goodwin '10 and Mike Grippi '10. Some college students say that having a roommate is like having a sleepover with your best friend every night. This was not the case for me as a freshman. At home I always had my own room, and suddenly I had to share a small space with a stranger. Our different class schedules and different preferences for when to study and sleep led to disagreements about when we could play music, watch TV, and have friends visit. As a neat freak who likes to go to sleep early on weeknights, I was challenged to cope with her sloppiness and late nights. In the end, I moved to a single room, and my roommate found a more compatible roommate. If you and your roommate are like night and day, don’t panic. Most roommates find some way to coexist even if they don’t become lifelong friends, but what happens when two people just can’t make it work? STEP 1 Get help from your RA. He or she can lend a sympathetic ear and help you find ways to compromise. STEP 2 For more serious conflicts that your RA can’t resolve, visit Ithaca’s counseling center. It’s another great campus resource for mediating conflict between roommates. STEP 3 The Office of Residential Life allows you to make a room switch after the first two weeks of classes. You fill out a form requesting the kind of room you’d like to move into, but you’re limited to what’s available, and you could wind up with another unpleasant roommate. It doesn’t matter whether you grew up as an only child or shared a bedroom with your siblings. Living in a small space with someone you hardly know can induce culture shock. Although many roomies bond and become fast friends, others don’t, and conflicts can arise in even the best of relationships. Here are five of the most common roommate friction points and some helpful tips on how to deal with them. You like to study in silence; she needs noise. Take time to talk about when and how you like to study before classes (and the related stress) start. You should both be able to study in your room, but it helps to be .exible. Taking your books to the library or Campus Center -- both of which have wireless Internet access -- while your roommate studies in the room is a good compromise. You may even discover that you prefer studying outside your room! You’re a total neat-freak; she’s a slob. You can’t really force your room­mate to pick up after himself, but you shouldn’t have to live in a smelly or messy room either. Try to set a standard for overall room neatness that you can both agree on, and alternate turns taking out the trash, cleaning out the fridge, and getting the vacuum from the resident assistant (RA). After all, those cookie crumbs may be on his side, but you can bet those ants will be all over the room! You’re an early bird; she’s a night owl. 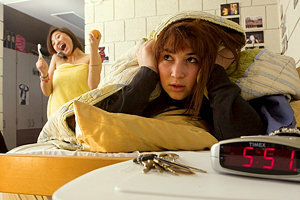 If you get up early for classes and your roommate likes to sleep until noon, be courteous -- try not to let your alarm clock ring for too long, and try not to make too much noise in the morning. Hopefully your roommate will return the favor by not blasting music or the TV until 2:00 a.m. You both deserve to get your much-needed rest, but this area is one that may take lots of compromise. You’d never borrow something without asking; he doesn’t respect your things or your space. It’s sad but true: some roommates may eat your food, borrow clothes and other items without asking, or invite guests without first consulting you. There’s nothing worse than being uncomfortable in your own space, so set clear expectations and boundaries right from the start. You’re here to study; he’s here to party. Some students take the freedom of college life to extremes. If your roommate’s after-hours behavior becomes an issue for you, confront him or her immediately. If you can’t work this one out on your own, you may need help from your RA or the counseling center, especially if your roommate’s partying becomes a health or safety concern. Here’s the cardinal rule about roommates: never simmer in silence. Always talk through issues that come up. During the first few days of school your RA will give you a roommate contract so you can discuss all the details of living together, from who takes out the trash to how late guests can stay at night. Of course you can change the rules of the contract as the year progresses, but if your room­mate breaks a rule, speak up! Little annoyances can become big issues later on if you don’t make your voice heard.